When I started planning my thru-hike, I assumed the “once and done” approach would apply to my gear selections. I had no idea I’d spend hours upon hours different stoves, sleeping pads, tents and other equipment, meticulously comparing features, prices, and warranties. Can’t you just go to Amazon (or REI) and order everything you need? Nope! Finding the right gear is a lot more complicated than that. The perfect gear list is a myth. I’m a hopeless gear geek. Put these two things together and I find myself on a never-ending quest to discover the ideal gear list for me. I’ve learned that every hiker is different, and every hike is different. What works for me on a trek from Springer Mountain to Unicoi Gap might not work for you on the very same hike in the exact same conditions. And the gear I pack for that trip might be the wrong choice for a trip in a different time and place. The “ideal” gear list is very much a function of personal preference, physical condition (height, weight, build, health, and fitness), weather and terrain. I have to remind myself of that when I’m surfing my Facebook groups for recommendations and watching gear reviews on YouTube. Input from other people is certainly helpful and much appreciated but in the end, I have to decide for myself what works best. I knew I was in trouble when I began to ponder the question of “What’s a gram worth?” I started calculating a “price per gram saved” formula and my Excel gear spreadsheet quickly blossomed to include not just what I already owned, but wish-list items that would save me an ounce or six. Case in point: my first cook pot. The 1.1-liter GSI Halulite Minimalist is pretty cool. 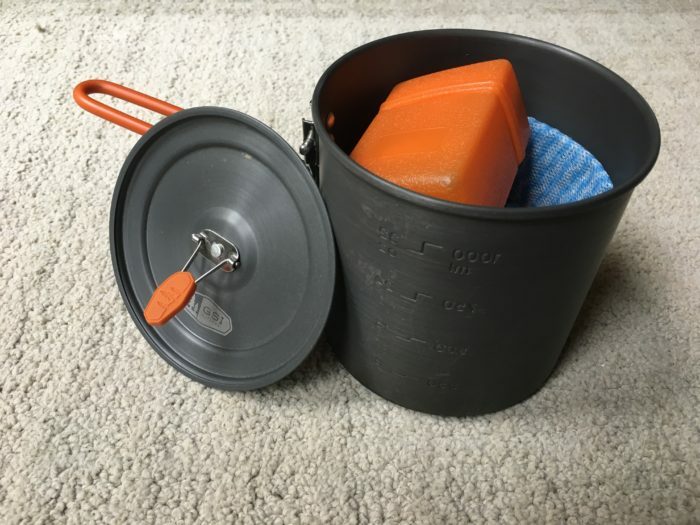 It is lightweight aluminum with a well-fitting lid and a coated handle (so your hands don’t get burned) that folds over the top to keep everything together. A fuel canister, my stove, and a few other items fit nicely inside. What’s not to like? Well, it weighs 234g – just over 8 oz. That’s half a pound! It didn’t seem like much when I made that purchase. Now I total up the weight of everything in my pack and think about carrying those 8 ounces for 2190 miles, and suddenly it feels a lot heavier. Could I go titanium and save a few ounces? At what cost? The UPS driver – who now knows my address by heart – will drop off a new titanium pot today. I agonized over the decision and finally decided to try a smaller Snow Peak pot with fry-pan lid that cuts 59g from my pack. I could have saved more weight (the Toaks 900ml titanium pot is just 120g – very tempting), but the idea of having a small pan I can use as a bowl or to cook up some tiny pancakes won out. Cost per gram saved? $0.25. Worth it? I’ll see. I have these “weight vs. price vs. comfort” battles daily, especially when I think about the luxury items I want to carry. My pillow is the perfect example. Many die-hard ultralight backpackers wouldn’t even consider carrying a pillow. They’ll vote me out of the club (if I ever qualify in the first place) when they hear I’m thinking of carrying not one but two. Yes, I’m all about a good night’s sleep. I do the math, wondering what tradeoffs I can make to keep my pack weight down and still have a cozy spot for my head at night. The 59 grams I saved on the pot is about 2 ounces. 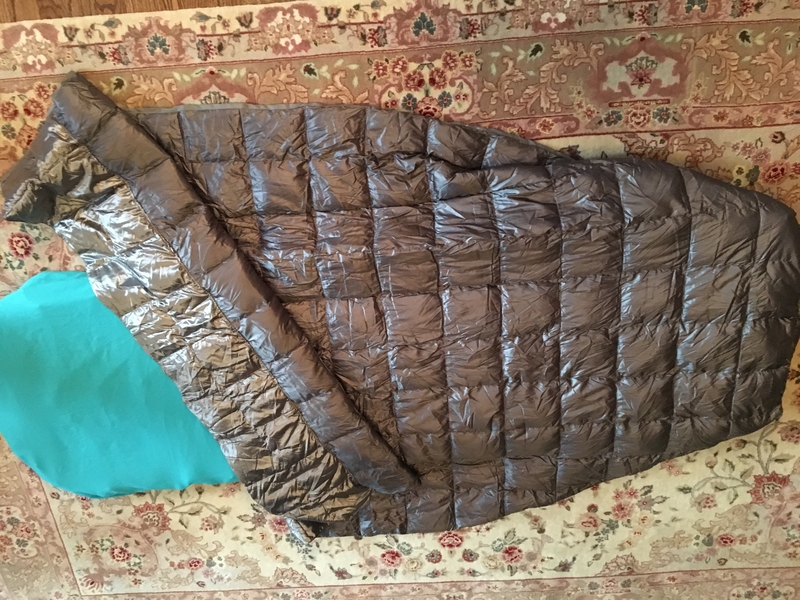 My little Hyperlight Cocoon pillow weighs 2.9 ounces. If I ditch the case for my stove, I’m just about even. What will I give up for the second pillow? I don’t know… yet. Something will have to go. Every item in my pack is enduring my scrutiny right now. Nothing is above analysis. What to keep, what to drop? Do I love it? Can I do better? So much for “buy it once and be done.” I’m searching and shopping all the time. The struggle is real. I tell myself it’s all going to be worth the effort when I hit the Appalachian Trail to thru-hike in a few months. I’ll dial in my perfect gear list and be a happy hiker, the Goldilocks of the trail with my “just right” combo of weight and comfort. When I can’t find precisely what I want I even put my sewing skills to the test. Making gear lets me try new ideas and designs I haven’t seen in the market. It can also save me some money if a lightweight item I have my eye on is simply out of reach financially. I won’t be making a tent or a backpack, although I know some people have done so quite successfully. 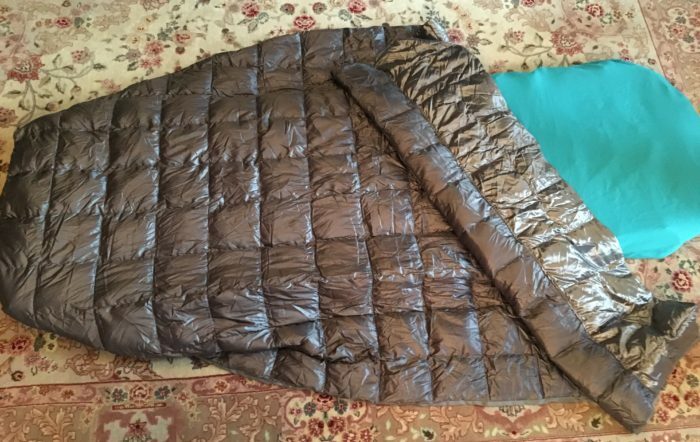 I am tackling a silk sleeping bag liner and a few other projects to help me capture the ideal cost/weight ratio. There will always be something newer, lighter, or better to try. I’ll be ready to hit the trail come April, but I’ll probably never be done refining my gear list. That’s OK. I’ve discovered that the gear geek in me really enjoys researching, testing, and evaluating equipment. The problem-solving challenge of figuring it all out is actually kind of fun. When I get a little closer to my final AT gear list, I’ll share it here along with some of the alternatives I considered, and I’ll let you know why I chose what I did. Your gear article is spot on! Good job! I too am a 2018 thru hiker… good luck and keep writing. Thank you for writing what’s inside my head!